Tendons are the cords that attach muscle to bone and are highly involved in the transfer of muscular tension to the skeleton, thereby relieving the stress placed on muscles . This involvement requires strength, elasticity and flexibility. The Achilles tendon, named after the great mythological warrior and hero of Homer’s Iliad who died after an arrow pierced his ankle, represents the largest and strongest tendon present in the human body, and attaches the calf muscles to the heel bone. It can withstand loads in excess of 1000 pounds from actions such as squat jumping, running and hopping, but is the most commonly ruptured tendon in the body. The incidence rate of Achilles tendon rupture has steadily increased throughout the years, with a current recorded incidence rate of 21.5 per 100,000 in the Finnish population, 32.6 per 100,000 in the Danish population and 6 per 100,000 in the Scottish population. The incidence rate in recent times in the general population is unknown. 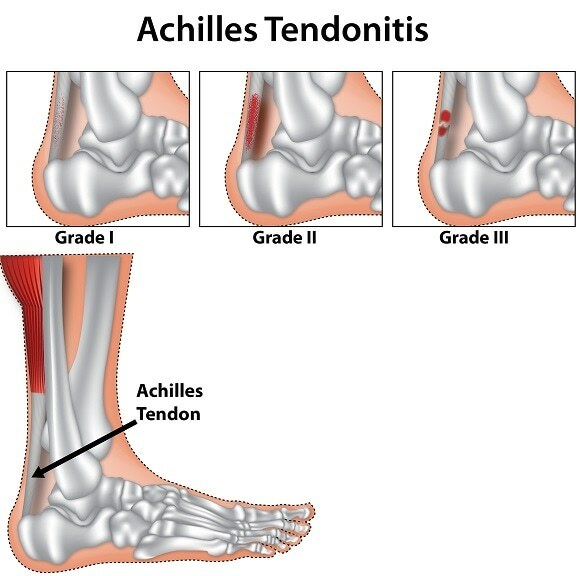 Achilles tendinopathy, synonymous to Achilles tendinitis, encompasses a wide range of overuse injuries, from inflammation of the tendon to tendon rupture. When first described in medical literature, injury to the Achilles tendons was noted to bring on dire symptoms and eventually (if not treated), death. It was also noted that if injury was too severe, surgery was a necessity. It is now known that the Achilles tendons have a low blood supply (vascularity), and hence poor healing potential. It has been estimated to be responsible for up to half of all sports related injuries, but 75% of these cases take place in middle aged men taking part in sports. Paratendinopathy – where the sheath is inflamed. Tendinopathy of the tendon body – this is a non-inflammatory, degenerative injury affecting the tendon body itself. Pantendinopathy – this is a combination of the two conditions described above. Tendon rupture – this is where the tendon ruptures, or tears. This type of injury is rare. Excessive loading of the tendons, however, is the most common aetiology. For acute cases, there is swelling and build-up of fluid in the region. When touched, tenderness is greatest 2-6cm above the point of insertion for the tendon. For chronic cases, pain is exercise induced (as described above) with excessive fluid production and popping sensation after an activity. Diagnosis of Achilles tendinopathy is usually based on a clinical examination and history of the injury. An example of a specific test utilized to find defects in the Achilles tendon is the Simmonds or Thompson test, where the calf is squeezed as the patient lies face down with the feet hanging off the edge of the bed. If there is no movement of the foot, this indicates rupture of the tendons. Imaging techniques can be used to verify clinical findings as well as exclude other possible disorders. The ultrasonography is commonly used, due to its availability, rapidness and cost effectiveness. Magnetic resonance imaging (MRI), however, is the gold standard. Early treatment gives the best outcome, and conservative treatment can be employed at this stage. Activity modification is key, with reduced intensity and frequency, but complete rest can be detrimental. That is because tendon loading actually stimulates repair and remodelling. Cryotherapy can be helpful in alleviating the symptoms, including pain relief. Therapeutic ultrasound is another means of intervention that can help with collagen healing. Stretching and strengthening can help restore tissue elasticity and preserve muscle-tendon function, reduce strain on the tendon and restore ankle joint mobility. Eccentric muscle training has also shown promising results in decreasing the pain in chronic cases. In 24-45% of patients surgical intervention has to be considered due to failed results from conservative treatment. Currently, there is no conclusive evidence on which treatment regimen (that is, whether it is conservative or surgical) is superior. Maffulli N, Sharma P, Luscombe KL. Achilles tendinopathy: aetiology and management. J R Soc Med. 2004;97(10):472-6. doi: 10.1258/jrsm.97.10.472. PubMed PMID: 15459257; PubMed Central PMCID: PMCPMC1079614. Mafulli N. Current Concepts Review – Rupture of the Achilles Tendon. The Journal of Bone and Joint Surgery. 1999;81(7):1019-36. Freedman BR, Gordon JA, Soslowsky LJ. The Achilles tendon: fundamental properties and mechanisms governing healing. Muscles Ligaments Tendons J. 2014;4(2):245-55. PubMed PMID: 25332943; PubMed Central PMCID: PMCPMC4187594. Lantto I, Heikkinen J, Flinkkila T, Ohtonen P, Leppilahti J. Epidemiology of Achilles tendon ruptures: increasing incidence over a 33-year period. Scand J Med Sci Sports. 2015;25(1):e133-8. doi: 10.1111/sms.12253. PubMed PMID: 24862178. Gulati V, Jaggard M, Al-Nammari SS, Uzoigwe C, Gulati P, Ismail N, et al. Management of achilles tendon injury: A current concepts systematic review. World J Orthop. 2015;6(4):380-6. doi: 10.5312/wjo.v6.i4.380. PubMed PMID: 25992315; PubMed Central PMCID: PMCPMC4436906. Ahmed IM, Lagopoulos M, McConnell P, Soames RW, Sefton GK. Blood supply of the Achilles tendon. J Orthop Res. 1998;16(5):591-6. doi: 10.1002/jor.1100160511. PubMed PMID: 9820283. Fisher T. Synopsis of causation: Achilles tendinopathy (Achilles tendinitis). In: Ministry of Defence, UK 2008.